Nikonworld.com recently posted an extended audio interview with Michael talking about his images, how he got them and the equipment used to capture the images published in the Nikon World Magazine article. You can check out the interview at http://www.nikonworld.com/. 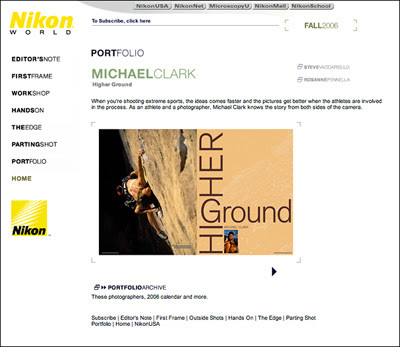 Click on Portfolio in the left-hand menu, then click on Portfolio Archive and choose Michael Clark from the list of Nikon photographers. The opening spread of the Nikon World Magazine article will appear (as below) – just click the “play” triangle below the spread and the interview and images will start. The interview lasts about 15 minutes and includes commentary on the images that Nikon chose for the article.